Sometimes I pick up a book, not exactly planning to bring it home. Somehow I forget that it’s in the pile when I check out and it ends up on the reading shelf by my chair. Such is the case with Panorama by Steve Kistulentz. I took it off the shelf just the other day and ended up reading the whole book in a single day. That’s a win for for readers everywhere. 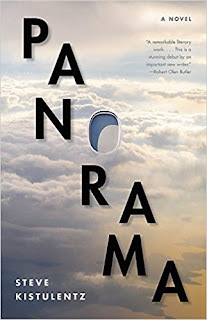 Panorama features an ensemble cast of characters in different cities, ultimately converging on the same moment in time and place. New Years Day is the time for a new start. Everyone is given a mostly blank slate with which to improve themselves. Faced with stark realities, the characters all have decisions that need answers. Richard MacMurray is a pundit who appears on different news shows to comment on current events. Coming off a relationship that has him questioning his standing in life. His sister, Mary Beth, is a single mom who is ensnared in a relationship with her boss that she has begun to question, and her son, Gabriel simply needs her. Meanwhile, after breaking up with Richard, his ex-girlfriend finds herself in an unsatisfying relationship with a younger man. As Richard prepares to take a new step in his career, the specter of a crashed airplane approaching Dallas dominates the news. Unbeknownst to him when he first hears the news is that Mary Beth was aboard the flight. With her death, Richard becomes Gabriel’s sole, living relative. Upon receiving this news, Richard must make a wholesale change to his life and the people around him. Panorama takes a long time to get to the actual plane crash. For most of the book, we learn about each of the characters and how they intertwined with each other to form a close knit story. In an ever invasive world of the 24/7 news-cycle, events have more and more of a global impact. That is showcased here in this novel. Each meeting, each relationship is heightened by that tenuous thread of a shared airplane flight and subsequent disaster. This book is about the characters. It is about the shared human experience. We are not alone in the world. Each of our actions sends a ripple through society around us. Kistulentz weaves a tale around these facts, creating a world that shows us all these connections. That chance meeting at the airport lounge might have bigger implications later that you can’t fully comprehend. Once I sat down with this book, I couldn’t stop. I love books about characters, especially well developed characters. This book is perfect for me. It has real people in real situations. The more realistic, the more I like it. Panorama is the perfect book for people who thrive on exploring interpersonal relationships spread across more than just the immediate character’s lives. This is a first novel. I can’t wait for the next book. Steve Kistulentz is a talented writer with a bright future. Craig Bacon is not a big fan of flying. He’d rather read about it instead. The book is always better.